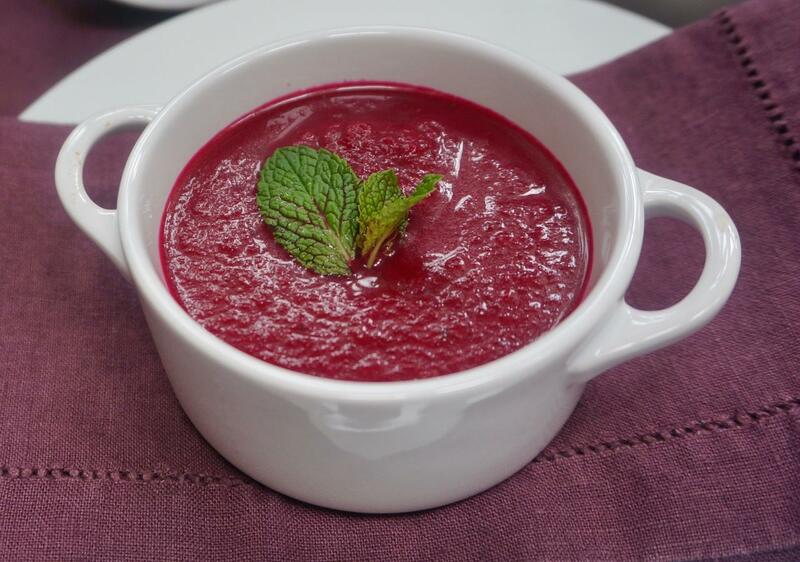 A smooth, pureed soup of beets garnished with mint and citrus. I can’t eat borscht that comes from a jar that’s been sitting on a supermarket shelf for who knows how long. So sue me. Tell me I’m a snob. I just can’t. It’s the wrong color, it’s too thin and has these shimmering chopped-looking things on the bottom that I suppose are beets but remind me of pocket lint. But I do love borscht, all kinds. Years ago I was surprised when a friend served me a version that wasn’t at all like the simple beet soup so familiar to Ashkenazi Jewish families. Hers was a thick, marrow-bone based dish laden with vegetables that included lots of cabbage, carrots, parsnips and potatoes, and beets of course. She told me this was the “real thing” and after doing a little research I learned that borscht covers a lot of ground and can be vegetarian or made with meat and even poultry. It may or may not be chock full of vegetables, but it’s always a slightly tart or sour soup with beets as the common denominator–whether it’s Ukrainian, Russian, Polish, Jewish or any other type. My friend’s borscht is a hearty dish, fit for cold weather comfort, but now, with the arrival of spring and warm weather, I want a lighter, beets-only version–more like the kind sold in the jars, but thicker, richer and more flavorful. I’ve experimented with several recipes and I love this version with orange and mint. 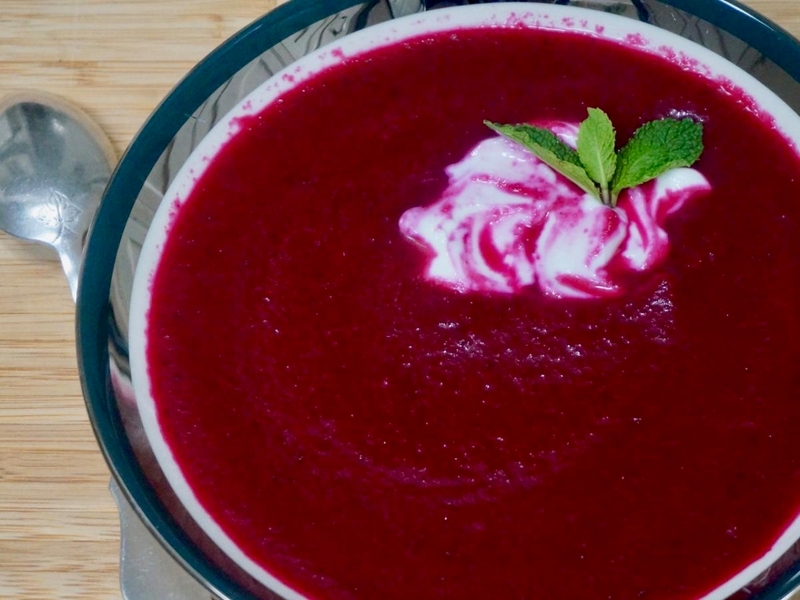 There’s enough orange peel and apple to give it that familiar borscht “tang” which is balanced by sweet beets. You can make it with or without dairy, and you can serve it hot or cold. You can add half-and-half cream or coconut milk as an enrichment. Make it more substantial by placing slices of hard cooked egg or boiled potato into each serving, or top the soup with fresh mint, an orange slice or a blob of dairy sour cream or plain, Greek-style yogurt. You can make this soup two to three days ahead. It’s a good family dish and makes a lovely first course for Shabbat dinner. Preheat the oven to 450 degrees. Scrub the beets, wrap them in aluminum foil and roast for about an hour, or until the beets are tender. When the beets are cool enough to handle, remove the skins. Chop the beets and set them aside. Reserve any natural liquids that have accumulated. Heat the olive oil and butter in a soup pot or large saucepan over medium heat. When the butter has melted and looks foamy, add the onion, apple, garlic and ginger and cook for about 5 minutes, or until the ingredients have softened. Add the beets (plus any accumulated juices), orange peel, mint, salt and pepper and stir. Pour in the water. Puree the soup with a hand blender or in a food processor or blender. Return the soup to the pan to heat through. For a creamier, thinner soup, add the cream. Serve garnished, if desired, with sour cream or yogurt for a dairy meal, or cooked egg or potato.